Judging by the latest product from Hermés, it seems Pierre-Alexis Dumas, Artistic Director at the luxury fashion house, has been spending a lot of time in Silicon Valley. 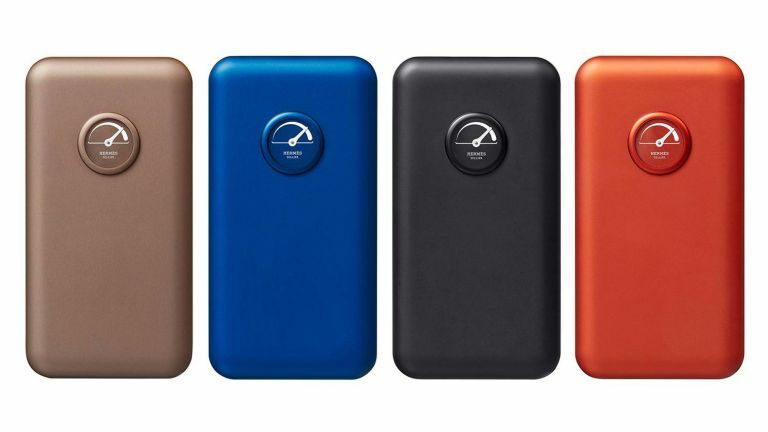 Because as well as designing an exclusive version of the Apple Watch, Hermés has also recently released a portable battery to charge your iPhone. When in Palo Alto Dumas met a craftsman who makes Marc Newson surfboards. As well as making the world's most expensive surboards, this guy is an expert at locking colour into aluminium with oxidation. Together with Hermés he crafted this smooth aluminium battery, about size of a bar of soap (just a little thinner). It features a small analogue dial which displays how much power is left inside. It comes in red, brown, cobalt, taupe, black and navy colourways. Of course, there is also an optional Barenia leather sleeve to keep it protected from scratches, with a window to display the power gauge. It's certainly the most stylish way to charge your phone, and will have you willing your iPhone's battery dead so you have a reason to whip it out. The Hermés Phone Battery is priced at £280, Hermes.com.